China has asked the world to respect its engagement with the African continent and say they will continue to invest in Africa. Yang Jiechi, China’s foreign minister, has urged all parties to view this strengthening alliance objectively. “We hope that all parties can view the cooperation between China and African countries in an objective manner, and respect the African friends in choosing cooperative partners by themselves,” said Yang. Yang was speaking at a press conference held on the sidelines of the annual parliamentary session. China is Africa’s largest trading partner. Yang called for more exchanges, less suspicions and accusations toward cooperation between China and African countries, and jointly promoting peace, stability and development in Africa. In an interview to the Financial Times earlier this week, South African President Jacob Zuma has warned western companies of changing their attitude to Africa or lose out on opportunities to China. “I’ve said it to the private sector from the western countries: ‘Look. You have got to change the way you do business with Africa if you want to regain Africa. If you want to treat Africa as a former colony …then people will go to new partners who are going to treat them differently’,” said Zuma. Hilary Clinton, US secretary of state, in 2011 warned about China’s “neo-colonialism” in places like Africa. China has indicated it will pursue closer ties with the African continent. The African Union has also been invited to participate in the BRICS Summit this year as an observer. 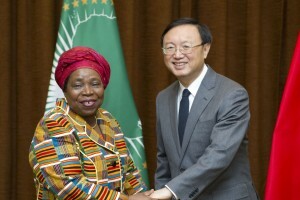 “If you want to walk fast, walk alone; if you want to walk afar, walk together,” Yang cited a traditional African proverb to elaborate the importance of cooperation with African countries. He said strategic partnership between China and Africa has developed fast over the years, and the two sides are actively implementing the follow-up actions to the fifth Ministerial Conference of the Forum on China-Africa Cooperation. China and Africa will especially promote cooperation in such fields as investment and financing, assistance, African integration, civilian exchanges, peace and security in Africa,” Yang said.